Isn’t that cool? I’ve found an article the other day about a robot that can fold itself like a tiny moving piece of origami. It’s only a centimeter long and controlled by magnetic fields. When finished their assigned tasks, they dissolve. One prototype robot dissolved almost entirely in acetone, another had components that were soluble in water. Absolutely brilliant! 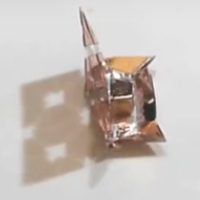 MIT researchers presented a printable origami robot that folds itself up from a flat sheet of plastic when heated and measures about a centimeter from front to back. Weighing only a third of a gram, the robot can swim, climb an incline, traverse rough terrain, and carry a load twice its weight. Other than the self-folding plastic sheet, the robot’s only component is a permanent magnet affixed to its back. Its motions are controlled by external magnetic fields.